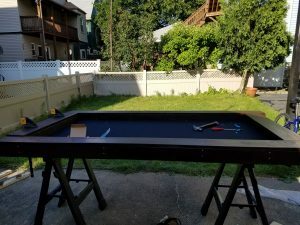 So I recently built a custom board game table. 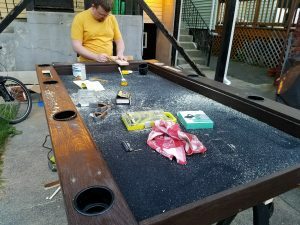 Board games have been a hobby for a number of years and while we had a nice big dining room table we used for games, I’ve wanted to build a custom one. 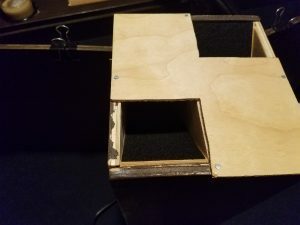 I always enjoy working with my hands to build or fix something even though I spend most of my days on a computer somewhere. 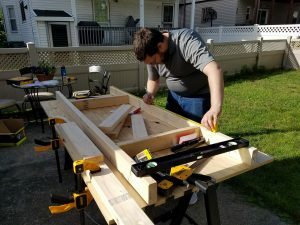 I’ve been looking at plans for a while and had drawn up what I wanted to do and finally planned to build it over the 4th of July weekend this year. I figured I’d have several consecutive days off work with nice weather for working outside and especially painting. I’ve documented my process below with some commentary. I wanted to do a recessed play surface with cup holders incorporated somewhere. Links to the plans are at the bottom. Marc measuring out pieces for the support frame on the bottom of the plywood sheet serving as the base. Here’s the finished frame screwed to the bottom of the surface to add support. Also have the legs on. 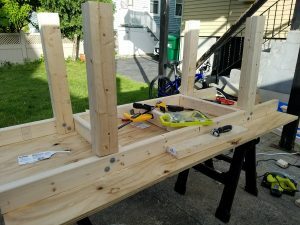 The legs are made from two 2x4s screwed together to make a pseudo 4×4. Gives you additional strength while saving money on materials. Here’s the table standing on its own. If that surface looks low, it’s because that’s the bottom of the inside recessed surface. Plenty sturdy too. I lay on it without feeling any movement unfortunately that picture got cut off by Marc’s phone. All these boards will become the outer box frame around the edge. 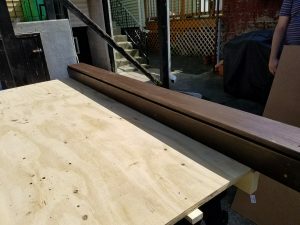 We’ll sand and stain them, then assemble the outer edge leaving the plywood as the recessed surface. Here’s one side of the frame stained with a nice dark color and assembled. Then a shot showing the underside where I added 2×4 supports to stabilize things. This piece and the others like it are screwed into the edges of the plywood and into each other at the corners. I initially had some reservations about the sturdiness of this for leaning on but it is quite comfortable though it flexes a small amount if you lean on the outer edge. Before screwing on the sides we had to put down the play surface. This is a 3mm neoprene sheet with a nylon surface on the top and a rubberized surface on the bottom to prevent sliding. 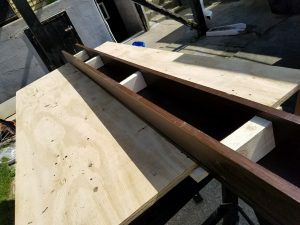 This is an amazing surface and I’d recommend it to anyone looking to build a table. 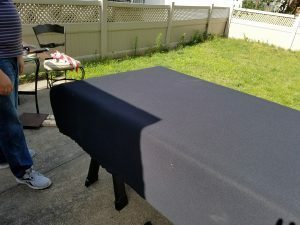 I got this sheet for about $50 from hook and loop outlet. 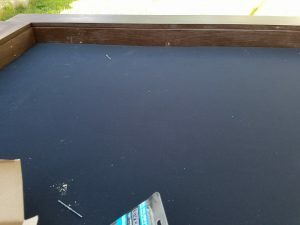 We trimmed down the neopren, nailed it into the edges of the plywood and superglued it to the bottom of the table. Then screwed in the outer box frames. Finally for the finishing touches. I drilled holes for cup holders with jigsaw and you can see Ben marking out where to cut for the dice/pencil trays. There are 7 matching stations evenly spaced around the table each with a cupholder to the right and a tray in front. For the trays I glued some backing board for the bottom. The 8th position will be a fold down DM tray. 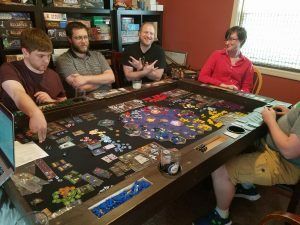 Here’s everyone for our “christening” of the table with Twilight Imperium 3. This worked out marvelously and I’m really pleased with how it turned out. 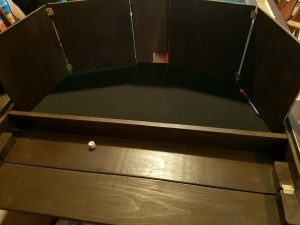 I finally got around to finishing the DM tray to complete the 8th station at one end of the table. This is made from the same 1×6” boards I used for the rest of the frame but has a hinged design on the sides to fold down from its closed position. All in all, this was a great project. I spent about $500 for the materials, saw horses, clamps and drill bits/glue/assorted supplies. I already had the four power tools I used (drill, circular saw, jigsaw, orbital sander). 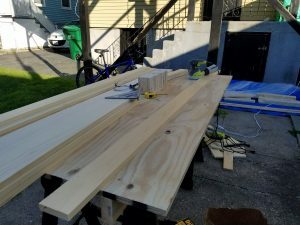 A miter saw would have been useful as I’m not very good at cutting perfectly straight lines with the circular saw, but I didn’t want to buy one and managed to get all the cuts close enough. 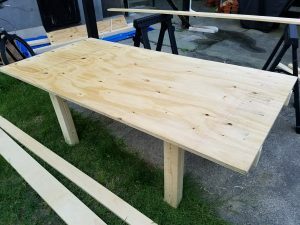 I finished all the construction of it over the 4th of July long weekend then did some finishing touches later that week. 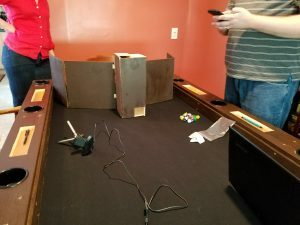 I adapted the excellent plans put up here: https://boardgamegeek.com/thread/1471747/build-gaming-table-150 to make the table rectangular (3’x6’ inner play area) and replaced one end with the DM tray. I used pine wood then sanded and stained the visible pieces with a dark color. There are still a few finishing touches I would like to do, but since we’ve been using the table so much I haven’t bothered. Those include doing some touch up staining on a couple scuffed corners, around the cup holders, and the inside edges of the pencil trays. 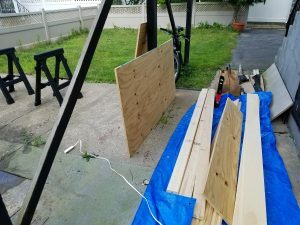 I’d like to get a coat or three of polyurethane on the whole frame to protect the wood from scratches and give it a nice semi-gloss finish. However those things are all incidental to using it and even so it looks pretty great and I’m extremely satisfied with it. Good luck on your own builds.